Welcome to Hopewell, an award winning lodge set in a superb, inspiring natural location on the water's edge of the magnificent Kenepuru Sound, in the Marlborough Sounds. Surrounded by native forest and turquoise waters, Hopewell is the perfect retreat for relaxing and at the same time provides a wide range of activities. Laze on our sunny, secluded and sheltered beach or enjoy a day’s walk on the Queen Charlotte Track. Explore the Kenepuru Sound in our kayaks and hike in the surrounding pristine native forest. Since the 1930s, Raetihi Lodge has built a reputation as one of the most popular destinations in the Marlborough Sounds. Extensively rebuilt, our accommodation and facilities are rated 4 star plus Hosted Qualmark with luxury and comfort amidst the serenity and nature of the Marlborough Sounds. A water's edge retreat, Raetihi Lodge sets its own standards for gracious and unsurpassed hospitality - we look forward to hosting you at our secluded lodge accommodation in the Marlborough Sounds. Grove Park's trees and gardens make for a restful, refreshing stay. You're in the cool climate wine capital of the world. Use Grove Park as your base or stroll to the restaurant right next door. An idyllic beach front boutique lodge in the heart of the Marlborough Sounds. Nestled in its own private bay, tucked between pohutukawa and palm trees lies the Lazy Fish Guest House. The perfect place for a relaxed and romantic get-a-way. A choice of luxurious waterfront apartments, spacious modern, or gracious heritage motel style accommodation in a secluded bay surrounded by native bush. Nestled in the bush clad hills of the Marlborough Sounds. 1, 2 and 3 bedroom luxury apartments positioned for individual privacy and delightful views. Set amongst stunning scenery in the magnificent waterways of New Zealand's Marlborough Sounds, Punga Cove is the perfect retreat for people wanting to relax in style. Explore the turquoise waters in our sea kayaks or visit nearby islands and cruise the sounds in search of playful Dusky Dolphins. Experience the leafy wonders of the Queen Charlotte Track or catch fish in the bay. Join an outer sound fishing charter or take a gourmet picnic lunch and a bottle of champagne to a secluded beach nearby. If you are looking to spend time in a different environment, away from the usual daily pressures - look no further than Punga Cove. The Peppertree is a luxury historic hotel offering the perfect retreat for exploring Marlborough.The Peppertree luxury bed and breakfast is located in 10 acres of lush farmland and surrounded by an extensive country garden. 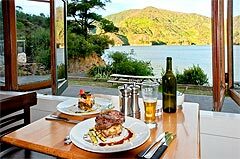 Peppers Portage is perfectly placed amongst the picturesque waterways and secluded bays of the Marlborough Sounds and spectacular walking and cycling tracks that follow the legendary Queen Charlotte Sound. These boutique lodges offer luxury waterfront accommodation in Marlborough Sounds and the perfect base for adventure, relaxation or indulgence. Nestled under Mount Furneaux next to Furneaux Wharf at the head of Endeavour inlet in the outer Marlborough Sounds of New Zealand, the No Road Inn is the perfect place for you to spend the first night of your Queen Charlotte Track walk, offering quality accommodation, a superb wine list, and mouthwatering cusine. The boutique vineyard home-stay Straw Lodge is housed in an eco-friendly straw-bale building nestled amongst the Sauvignon Blanc and Pinot Noir vines of the estate's private organic vineyard. Situated on the world renowned wine producing river flats of the Wairau Valley, it provides stylish, five star Bed and Breakfast Homestay accommodation as well as self-catering for individuals or small groups. Our modern beach front lodge bed and breakfast accommodation caters for people who enjoy peace and tranquillity and the special things that nature has to offer. Whether you are just looking for a night’s rest on your walk along the Queen Charlotte Track, or wanting a few days "away from it all", the warm hospitality of your hosts Ann and John Martin will ensure that your stay with us in the beautiful Marlborough Sounds is a memorable one. Join us at Mahana Lodge in the picturesque Marlborough Sounds, far from the hustle and bustle of city life. 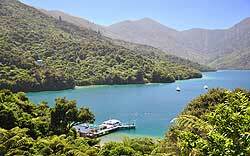 Set on the tranquil shores of the Queen Charlotte Sounds in Marlborough, New Zealand, Lochmara Lodge Wildlife Recovery and Arts Centre offers accommodation and activities to trampers, nature lovers, backpackers and families. Picturesque Furneaux Lodge is unique in the Marlborough Sounds with expansive grounds running from the native bush down to the sea. In combination with our award winning restaurant, it is the premier wedding venue in the Sounds. New Zealand Lodge accommodation set in spacious grounds in the Marlborough Sounds, ideal for weddings, honeymoons and retreats. 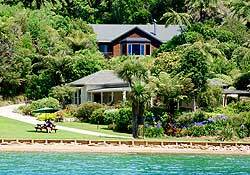 Tory Lodge in beautiful Maraetai Bay revolves around you. Most things are possible all you need to do is ask.